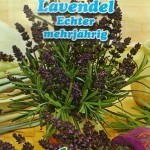 English lavender is an aromatic, evergreen garden herb that thrives in summer heat and dry weather. It is technically a subshrub, which means it behaves like a perennial but develops woody stems over time. This Western European species is more tolerant of moister growing conditions, which is why it is commonly grown in England, though it still thrives in heat and drought. 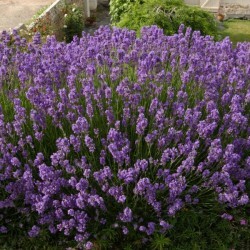 It develops a rounded, bushy habit and has fragrant, linear leaves of pale gray-green that turn steely gray in winter. Lavender blooms in late spring to midsummer, producing many slender, upright stems topped with spikes of densely clustered, violet-blue flowers. The highly fragrant blooms are attractive to bees, butterflies and other insect pollinators. They turn brown as they age and should be removed once spent to keep the plants looking tidy. This is the best form of lavender for cutting because of its long-stemmed flowers. Its flowers have been used in perfumes, poultices and potpourris for centuries, so this evergreen is a staple plant for the herb garden. If preparing the blooms for potpourri and sachets, cut them while fresh and hang them to dry. English lavender is also a fine choice for edging, containers and sunny dry spots where fragrance and summer color are needed. It also makes a fine container plant. Growing success depends on light levels and soil drainage; full sun and sharply drained soil are essential. Moist winter weather is especially detrimental and can lead to root and stem rot and eventually plant death. Its stems become quite woody and coarse looking over time. Plants of this age and constitution should be pruned back quite severely in spring. This will encourage a new flush of foliage, which will keep plants looking young and fresh. 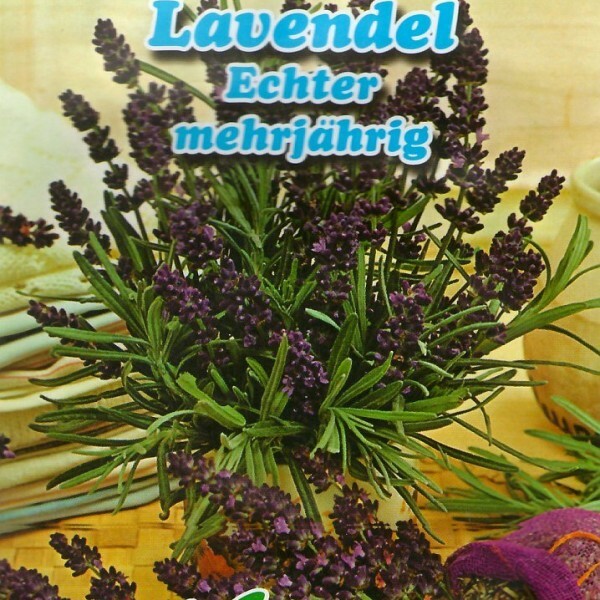 Germination Sow Lavender seeds from February to July on the surface of moist seed compost. Cover lightly (1-2 mm) with vermiculite or soil. Germinate in a propagator or warm room at +20-+25C. Keep soil moist till germination. Short cold and moist stratification at +2-+4C can increase germination rate and speed. Seedlings appear in 20-50 days. Remove cover then seedlings appear. Grow on at ~+15C. Transplant when large enough in to 10 cm individual pots.Transplant in to permanent position after the last frost 30 cm apart.